"This excellent and cool summer snack or side dish is very easy to make and takes very little time." Whisk together the vegetable oil, vinegar, sugar, pepper, mustard, and seasoned salt in a bowl; add the tomato and onion to the bowl and toss to coat; cover and refrigerate overnight. Here’s the salad to make when summer tomatoes are at their peak. Super easy and very tasty! This was FABULOUS! 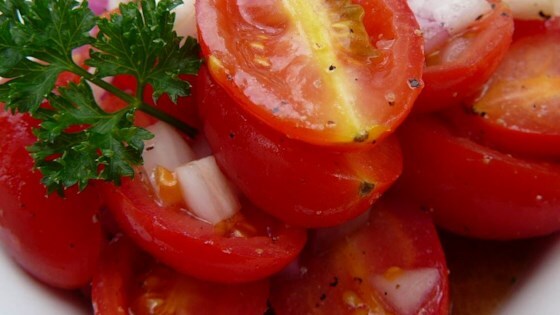 I used red onion(about 1/2 of a lg onion), white wine vinegar, & grape tomatoes cut in 1/2. I can't rave enough about this! It was a HUGE hit this weekend! Summery, tangy and simple. It was a nice accompaniment to our grilled steaks.